Most parents cringe at the thought of buying eyeglasses for their children because the responsibility of maintenance and care for glasses is often beyond the children’s capabilities. Not our parents! At Texas State Optical – College Station in College Station, Texas, children’s vision is our expertise. 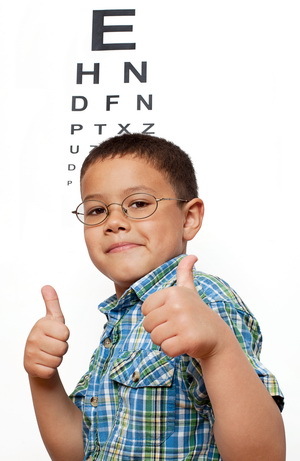 Follow these few easy steps to help your child see better and feel better about their new eye glasses. “We believe that your children should be actively involved in selecting their new glasses as this will help with their compliance in wearing them,” stated Dr. Taylor Marsh. Whether your child will be wearing their glasses for specific tasks or all the time, it’s important that they like the frames and feel good about how they look. Balance what they like against appropriate style (not adult styles) and expense (there is no need to purchase the most expensive brand). Manufacturers now make metal frames that incorporate many of the features previous contained only in plastic frames. Metal composition varies from manufacturer to manufacturer, so ask the optician which one is best for your child (age, activity, etc.) based on their experience with different alloys. Ask for hypoallergenic materials if your child has shown sensitivity to certain metals such as nickel which has been shown to cause an allergic. A nice feature to look for in your children’s glasses is temples with spring hinges. These hinges allow the temples to flex outward, away from the frames, without causing any damage. Although they sometimes cost a bit more, spring hinges can be a worthwhile investment for children’s eyewear. Children are not always careful when they put on and take off glasses, and spring hinges can help prevent the need for frequent adjustments and costly repairs. Children’s lenses should be made of polycarbonate or a material called Trivex, because these lightweight materials are significantly more impact-resistant than other lens materials. In addition to being the safe materials, they also are lighter in weight than regular plastic lenses. Polycarbonate and Trivex also have built-in protection against potentially damaging UV rays, and the lenses are scratch-resistant coated by the manufacturer or fabrication lab. This is another important feature in order to preserve the value of the glasses over a lot of wear and tear. Polycarbonate lenses generally cost the same as regular plastic lenses with UV and scratch-resistant coatings included. Trivex lenses may cost a little more than polycarbonate. Many retailers offer a warranty plan that will replace a child’s eyewear at no charge or for a small fee in case of damage to the frames or lenses. Consider opting for the warranty, especially if your child is under the age of 5 or a first-time wearer. Note that all warranty plans are not the same. Check for lens replacement costs with and without the warranty plan. Generally, if the warranty costs you less or about the same amount as the fee to replace one single lens, it is worth the price. Make sure the lens warranty includes a replacement provision if the lenses become badly scratched from normal wear. In addition to causing glare and blurred vision, surface scratches can compromise the impact resistance of the lenses, putting your child’s eyes at risk.